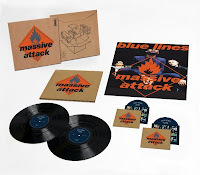 Massive Attack will reissue their 1991 debut album, Blue Lines, on November 20th via EMI. The landmark trip hop album has been remixed and remastered from its original tapes from the band’s studios in Bristol. The reissue will be available on CD, digital download, and as a deluxe box set that contains: the CD, DVD with 96K/24 bit high resolution audio files, the album split over two 180g vinyl LPs, and the original 24″ x 18″ Blue Lines promo poster. Both the CD release and box set will be packaged in 5″ and 12″ card mailers, respectively, with the album’s artwork screen-printed per the original release. In more good news, Massive Attack are currently in Bristol working on their follow up to 2010′s Heligoland, according to a press release In the meantime, turn back the dial and stream Blue Lines‘ cut, “Unfinished Sympathy”, below.